Commuter Rail passengers can expect heavy ridership Tuesday as Boston celebrates a Patriots victory. Add'l capacity will be added, but riders can expect some expresses running local or trains going express after reaching capacity. Bikes are not allowed. Queue lines will be in place throughout the afternoon at North Station and Back Bay to manage crowds and help expedite boarding. Make the trip smoother by purchasing round-trip tickets in advance using the mTicket app, taking earlier trains and using high capacity parking lots. 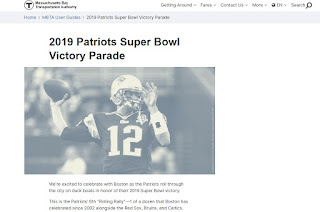 More information about what to expect Tuesday can be found at mbta.com/patriots.